Have you spent hours, maybe even days, reading tripadvisor and yelp to prepare for your next trip? Foodie research can be stressful, especially when you realize that the restaurant you want to go to stopped taking reservations for your dates a month ago. Didn't you know to call 3 months ahead on the first monday of the month at 9am? There is a cure for this insanity of over-researched, super-planned dining, and it's called San Sebastian. Here is how it works here. Walk off the beach, shake off the sand, and wonder into some pintxos bar, where you’ll be served every type of deliciousness: foie gras, iberico ham, smoked fish, veal cheeks, and wild mushrooms. Did you like the ham, but don't see foie gras? No worries. Just walk over to the next bar and see what they have. This is the land of promiscuous eating, so no bar expects you to stay for more than one or two bites. During the whole week, I couldn't stop marveling at the prices. Plated dishes that would fetch $12-18 as appetizers in the USA were going for 4 euro! 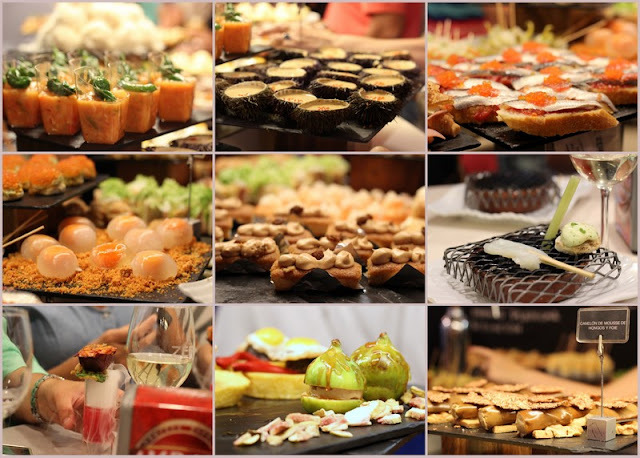 My first evening in this utopia of food was spent on a pintxos tour with San Sebastian Food. We went to 6 bars having 1 pintxo (sometimes 2) and 1 drink at each. Goiz-Bargi, La Cepa, Viña, Munto, and Borda-Berri were traditional, and Zeruko was innovative (dry-ice, foam, etc). This tour was perfect for San Sebastian newbies for many reasons. The main attraction for me was overcoming the barrier of ordering. Since many places didn't have English menus, most tourists were limited to pointing at the cold pintxos spread out at the bar. That’s where our wonderful guide, Agus, was extremely helpful. He ordered for us dishes from the hot menu that were the specialties of each bar. Agus also entertained us with stories about the history of San Sebastian, and explained local eating customs and traditions. On my second day in San Sebastian I got an unofficial pintxos tour from my friend Raquel and her family, who are San Sebastian natives. I also tried many of these places a second and third time to make sure they weren't one hit wonders. 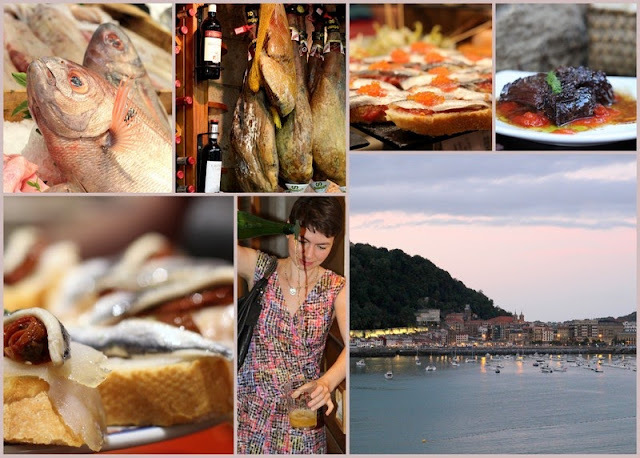 Here are the ones I’d go back to if I were in San Sebastian again. Borda-Berri -- If I had to judge on food alone, Borda-Berri would win the contest in a city that provides some very stiff competition. Veal cheeks, octopus a la plancha with quince, and pork rib were the best I’ve had in San Sebastian, and the best I’ve ever had anywhere in the world! But be prepared to fight for your food if you come during busy hours. No chairs or even bar stools here, and it can get packed. Senra -- Not only can this place cook, but it offers chairs, friendly service, and English menus. Don't miss the baby squid with chestnut puree, turbot with tomatoes and pistachios, and mushrooms with foie gras in warm aioli. Zeruko -- if you want “molecular gastronomy” on a budget, Zeruko is a gem. The variety is enormous, the food presentation is outstanding. This is a place to come and feed your eyes, camera, and social media platform of your choice. After a few days of bar hopping, I was ready for a sit down meal. My one splurge was Akelare. The restaurant was on a mountain overlooking the Atlantic. Looking at this infinite expanse of blue velvet, I couldn't tell where the ocean ended and the sky began. I consider myself impervious to restaurants' decorative charms, but you'd have to be made of rock to be impervious to the view from Akelare. Pedro Subijana's food was deceptively simple. Each ingredient was manipulated but without attracting attention to the labor involved. I felt as if he doesn't want to detract from the majesty of the ocean in front of you. What he wants is for you to taste it. Sea Garden: Prawn's sand, Mussel with "Shell", Sea Urchin Sponge, "Beach Pebbles", Seaweed "Coral"
hake and its kokotxa (chin) with oyster leaf and "mussel's beans"
After a week of this debauchery, I was starting to miss vegetables. Greens, particularly leafy ones seem to be forbidden on restaurant menus. For that, you'd have to go to France, but it's just a 30 minute drive and definitely worth a visit. I was surprised to find the food not as tasty as in San Sebastian, but it was a relief to eat something green, like the delightful pea soup at Zoco Moco in Saint-Jean-de-Luz. 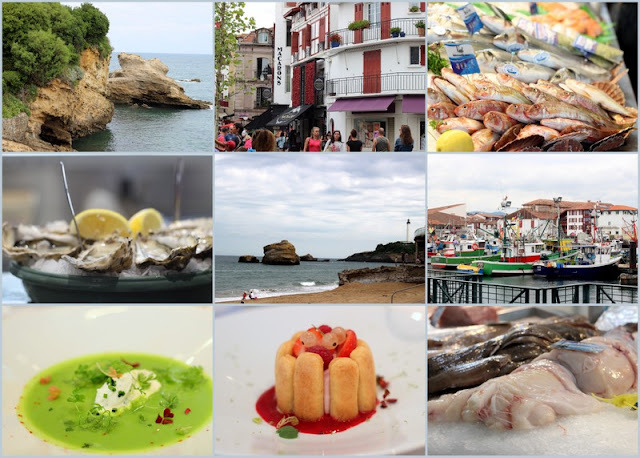 And don't forget to stop by Biarritz for its beauty, fantastic market, and oysters. Great article and great photos! So glad you had a good time. Let's hope we'll see you again in San Sebastian. Hey Helen, I m glad that you r back. Great post. How r kids? They might have missed mumma.